Working from a rural workshop on the Sharpham Estate near Totnes, I have been designing and making bespoke furniture for twenty years. The galleries below cover a range of my work over the years. By remaining an individual craftsman I am able to keep my prices competitive and, as well as offering many years experience, I give personal care and attention to all details from initial design right through to completed installation. If you have a project you wish to pursue I am happy to call on you to discuss your ideas, supply drawings and a quotation without charge. My kitchens are wood throughout. I have a huge selection of finished timber samples for you to select from. I use a veneered block board for the carcassing which I finish with Danish oil. The drawers are hand made in hardwood and set on the best German kitchen drawer slides. 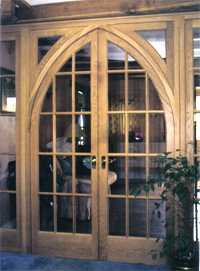 Doors are generally fitted with traditional solid drawn brass hinges and fastened with ball catches. For painted kitchens I make the woodwork from solid wood not MDF. 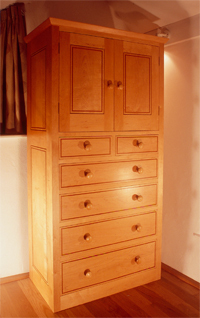 The second most usual place for fitted furniture in the home is wardrobes. I have made a wide range of styles. In Victorian and period houses painted traditional fitted wardrobes are very popular and timeless. I have made home offices, bathrooms and many living room bookcase and television display units. All pieces are designed to suit your space, requirements and taste.